Allows you to see tags & metadata for various audio formats within Opus if you have dBpoweramp Reference. 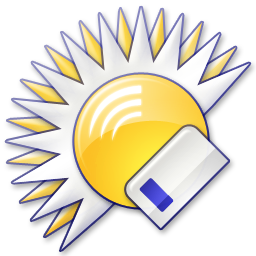 Support for some of the above formats will be added to the Audio Tags Plugin in the future, removing the dependency on dBpoweramp. However, it's unlikely that all of the formats above will be moved over. The dMCTags plugin will remain to handle the more esoteric audio formats. 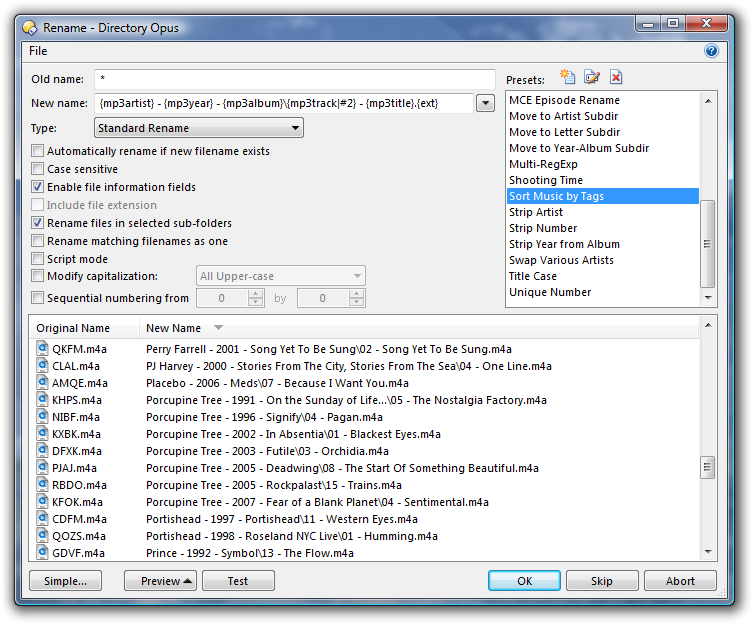 Directory Opus allows you to use music tags when renaming files. This lets you to tidy up your music's filenames or even rearrange the files into new album folders using your chosen of naming system. See the second screenshot below for an example. Tag data extracted by the dMC Tags plugin, with some WMA files for comparison. 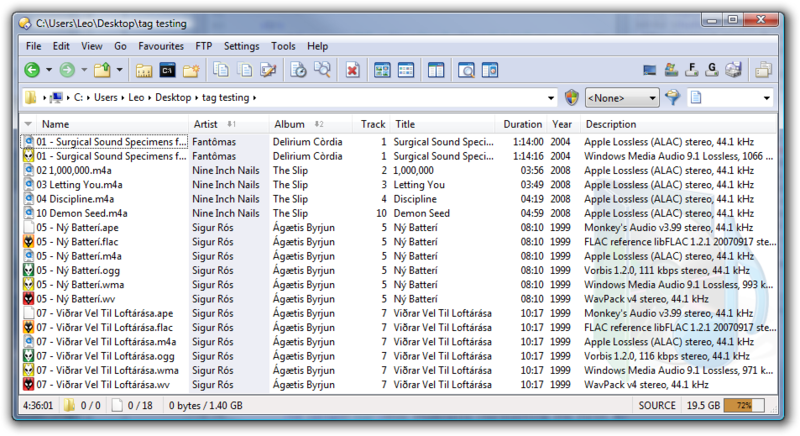 Sorting garbled iPod filenames into album folders using Opus and the plugin. The plugin requires dBpoweramp Reference. If you don't have it, or have a lesser version of dBpoweramp, then the plugin won't do anything. There is no 64-bit version of the plugin because there is no 64-bit version of dBpoweramp. If you are using 64-bit Opus and really want to use the plugin then let me know and I will consider writing a proxy to allow 64-bit Opus to talk to 32-bit dBpoweramp. The plugin can be exported with Opus to a USB device but will only work on target machines that have dBpoweramp Reference installed on them. In other words, the plugin itself is included in USB exports but dBpoweramp is not. The plugin will not read tag data from files within Zip (etc.) archives. dBpoweramp's API does not support data streams, only files, so reading tag data within Zip files would require extracting each file which would be very slow. Single files that are longer than one hour will have their reported times rounded to a whole number of minutes. For example, a file that is 1h 14m 16s long will be reported as 1:14:00 rather than 1:14:16. This is due to the way the dBpoweramp API reports track lengths. Bit rates are generally not reported for lossless files. The Bit Rate column in Opus is meant to display the encoded bit rate but, for lossless files, dBpoweramp reports the decoded bit rate (always ~1411kbps for 16-bit 44.1kHz audio). On the other hand, the plugin does report bit rates for lossy files since dBpoweramp reports encoded bitrates for them. The plugin is not perfect by any means. Over time, at least for some of the more popular formats and where alternative libraries or documentation exists, the plugin may be replaced by other plugins with fewer limitations. For now, though, the plugin may fill a hole for a few people at least. It was very easy to write, since most of the work is done by dBpoweramp, so for a small amount of time & effort I was able to add support for several missing tag formats to Opus. If you do not already use dBpoweramp then I strongly recommend you give it a try. I have been using it (along with foobar2000 for playback and complex mass-tagging) for several years now and it is excellent. The program provides convenient audio file conversion & tag editing within Explorer and Opus (via the right-click context menus; includes multi-CPU encoding), batch conversion of folders and hassle-free support for a wide range of audio codecs. dbPoweramp is also, in my opinion, the best audio CD ripper available; even better than the excellent Exact Audio Copy which was unrivaled for years. Compared to EAC, dBpoweramp features similar secure ripping abilities (which can be said for few, if any, other programs), better metadata retrieval (including cover-art, at least if you subscribe to AMG), more easily configured support for a wider range of audio codecs and, in my opinion, a slightly nicer user interface (progress and status are displayed in-line instead of via modal dialogs, for example). If you rip a lot of CDs and you are not using either EAC or dBpoweramp then you are probably doing it wrong! If you do look into dBpoweramp and want to use this plugin with it, remember that dBpoweramp comes in three versions (free, Power Pack, Reference) and only the Reference version provides the programming hooks that this plugin requires. The plugin requires dBpoweramp Reference. The plugin requires Directory Opus 9.1.3.0 or above. The plugin is 32-bit only (at least for now). Opus is installed to C:\Program Files\GPSoftware\Directory Opus by default. Opus, unless configured otherwise, will continue to run even after all its windows are closed. See: How to Exit Directory Opus. Copy dMCTags.dll from the zip to the Viewers sub-directory of your Opus installation. Update to enable the plugin to support USB export on future versions of Opus. Requires Directory Opus 9.1.3.0 or above. Small internal change. Unlikely to make a difference but update if you feel like it. Requires Directory Opus 9.1.0.6 or above.